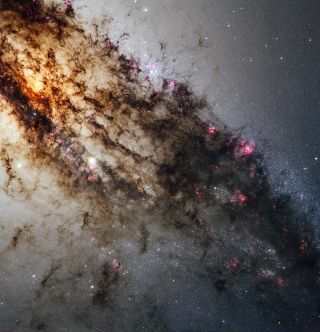 This new image, taken by NASA's Hubble Space Telescope, reveals never-before-seen details of the galaxy Centaurus A. The image is a composite, showing features in the visible, ultraviolet and near-infrared spectrum. A dusty galaxy neighboring our own Milky Way shines bright and brilliant in an eye-catching new photo from the Hubble Space Telescope. The image, released Thursday (June 16), is a close-up of the galaxy Centaurus A, which is also known as NGC 5128 and is located about 11 million light-years from the Milky Way. Dust crosses the entire galaxy in a huge stripe, obscuring much of Centaurus A's heart in the visible range of the light spectrum. Centaurus A is somewhat warped, leading researchers to believe that it collided and merged with another galaxy at some point in the past. The shockwaves from this event likely caused hydrogen gas to coalesce and sparked intense star formation in some areas, researchers said. These star-formation regions are visible as red patches in the Hubble photo. The galaxy's compact nucleus contains a highly active supermassive black hole at its center. Powerful jets blast huge amounts of radio and X-ray radiation into space. These jets aren't visible in the new image, however, as Hubble's instruments aren't designed to pick up these wavelengths of light. Centaurus A is relatively nearby in astronomical terms, and it is also quite bright. This combination makes the galaxy an attractive target for amateur astronomers in the Southern Hemisphere, where it is visible. Stargazers can see the galaxy through binoculars, while larger amateur telescopes can make out some of Centaurus A's distinctive dust lanes, researchers said. Hubble took the image in July 2010 with its most advanced instrument, the Wide Field Camera 3. Hubble, a joint effort between NASA and the European Space Agency, has been snapping amazing images of the universe from orbit since its launch in April 1990. The telescope has been repaired five times over its long life, but it's expected to keep going strong until at least 2014.